Device Doctor Finds Some Outdated Drivers...But Does It Do Enough? Updating drivers is one of those tasks you know you should be doing, but it's sometimes hard to make the time. It can be a whole lot easier with DriverScanner 2012, a $30 utility (free demo) that automates the process, saving you the time and hassle of doing it yourself. DriverScanner's dashboard makes it easy to gauge the overall health of your PC. DriverScanner 2012 works very much like its rivals Perfect Updater and Driver Reviver. It scans your Windows PC for out-of-date drivers as soon as you launch the app, and quickly reports back to you on the status of your system. Like its two competitors, DriverScanner 2012 has an attractive visual interface. The offending items are listed with an icon that immediately makes it apparent whether your drivers are "old," "very old," or "ancient." DriverScanner uses large icons to identify the drivers, too, making it easier to tell when the application is talking about a sound controller instead of a USB controller, for example. I don't like how the app devotes time to hawking Uniblue's other products, but I do like how DriverScanner's overview tab makes it easy to gauge the overall health of your PC. Much like Driver Reviver, it offers a summary of your PC's current state, listing the number and severity of outdated drivers. Unlike Driver Reviver's text-heavy list, though, Driver Scanner uses a graphical "System Barometer" that is easy to check at a glance. DriverScanner identified just four outdated drivers on my PC while scans by both Driver Reviver and Perfect Updater identified 10 and 11 outdated drivers, respectively. DriverScanner says that the disparity is due to the fact that the drivers in question were for Intel USB Enhanced Host Controllers. While rival products identify these separately, DriverScanner identified drivers that were packaged "together with various other related drivers in one single motherboard chipset driver." Indeed, after I used DriverScanner to update the drivers it recommended, the other two applications no longer identified those drivers are being outdated. Once the outdated drivers are identified, updating them is easy. A "Download All" button takes you to a page where you can watch the progress as DriverScanner downloads the newer versions for you. Once all of the downloads are complete (a process that took just a few minutes on my system), you can install them one at a time. Before each installation, which you launch with a single click of your mouse, DriverScanner automatically creates a system restore point for you. Rival Perfect Updater does this important task for you, too, but it's a step that's missing from Driver Reviver. 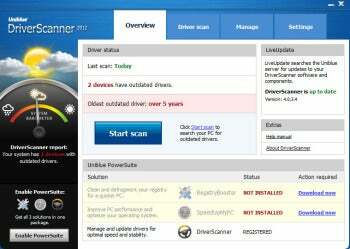 DriverScanner 2012 offers an easy and complete way to update your drivers and keep tabs on the overall health of your PC. It's easy to use and quickly updated all of my outdated drivers.